It is a poor reflection of the pro-Remain campaign that even two years after the referendum, much of Britain is still basking in shocking ignorance about how the EU functions, the reason it exists, and how it is a democracy run by its members for the benefit of its members. We are leaving the EU based entirely on a misunderstanding and worse, a pack of lies. There is probably less than a 10% chance of another referendum, and if there is another referendum, currently only a 50-50 chance of Remain winning. Unfortunately, the Remain campaign, starting from May 2015 up until now, has been entirely inept, disorganised, and without a dynamic and effective strategy. We should have won the 2016 referendum without much difficulty. But the Remain side was smug, and not at all prepared for the panzer warfare launched with such brilliant effect by the Leave campaign, albeit all based on lies, deceits and false promises. Remainers lost forty years of opportunities at awareness raising since winning the 1975 referendum. We let the likes of the Daily Mail, the Daily Express and the small UKIP party pollute the nation with misinformation about the EU and EU migrants. For most of the forty years it didn’t seem to matter. Leaving the EU was not a mainstream call or promise of the main parties. There were grumblings, but these were on the sidelines of politics, occupied by a few diehard Eurosceptics. Complacency ruled. If there was another referendum, of course the status quo would win. David Cameron banked his prime ministership on it. But he lost, and left. It was a huge shock that Leave won the referendum – a shock to Remainers, and a shock to Leavers. Few expected Brexit to win. It’s rare indeed for a referendum to go against the advice of the government, of Parliament, of the main parties and, dare I say it, of most experts. The official ‘Stronger In’ campaign lacked panache, flair and any sense of direction. Their strategy was no match for the Leave campaign. Trying to scare voters into opting for Remain was no way to win. 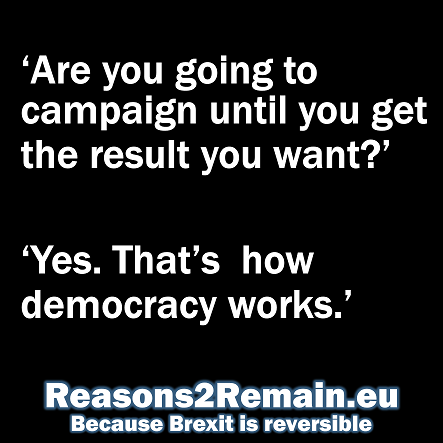 The Remain campaign spent precious little time or energy explaining to the nation how the EU works, how it is a democracy, and how Britain has greatly benefited from its membership. Fear, not facts, ruled the day. Or so the Remain strategists thought. But when the day came, fear lost. We should have learnt. The British don’t like to be scared or cowed into doing something. They react the opposite way. That should have been known from the stoical reaction of the Brits to the Blitz, when the Nazis thought they could frighten Blighty into submission. How wrong they were. And how wrong was Stronger In. Their strategy didn’t work. They lost the Referendum, but they also lost the arguments. The Leave lies about the EU won, and there was little in the way of an effective counter attack, using the only antidote known to work against lies: the truth. Well, that was two years ago. What of the truth now? 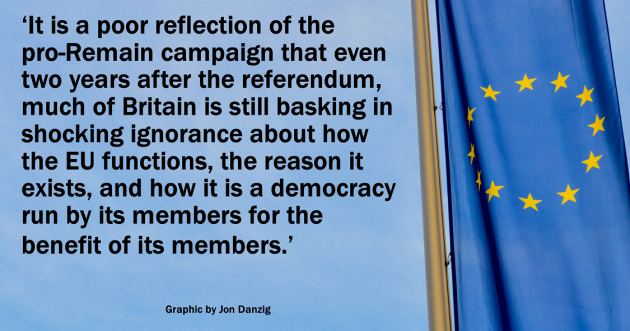 Unfortunately, misinformation about the EU still prevails. And there is still no effective counter-attack. There is no national, prominent, brilliant and well-funded ongoing awareness raising campaign by any pro-EU, anti-Brexit group to undo the lies of Leave. (Yes, there are many smaller groups trying, often valiantly, but nothing that is anywhere close to a dazzling, nation-wide, compelling campaign that’s needed to undo the lies of Leave politicians). Across the country, enormous numbers of people still believe that the EU is a dictatorship run by unelected, faceless bureaucrats. They still believe that the EU rules over us, without us having any real say. They still think that the EU annual membership fee represents poor value for money, which would be better spent on something else. They still believe that we have uncontrolled borders, with too many citizens from the rest of the EU coming here, without any restrictions. They still think we’ll get our country back as soon as we’ve left the EU. They even still believe that the EU accounts are a sham that the auditors refuse to sign off. All these beliefs are based on myths; on misinformation that has been carefully and successfully imbued into the nation’s psyche and mindset over many years. And they could all be undone by a proper explanation to the nation of the truth. Because when properly explained, truth outshines lies, at least eventually. All these successful campaigns and many others were based on getting facts and the truth out to the public in an effective, believable, emotive and memorable way. It’s something the pro-Remain movement has not done well. It’s hardly done it at all. 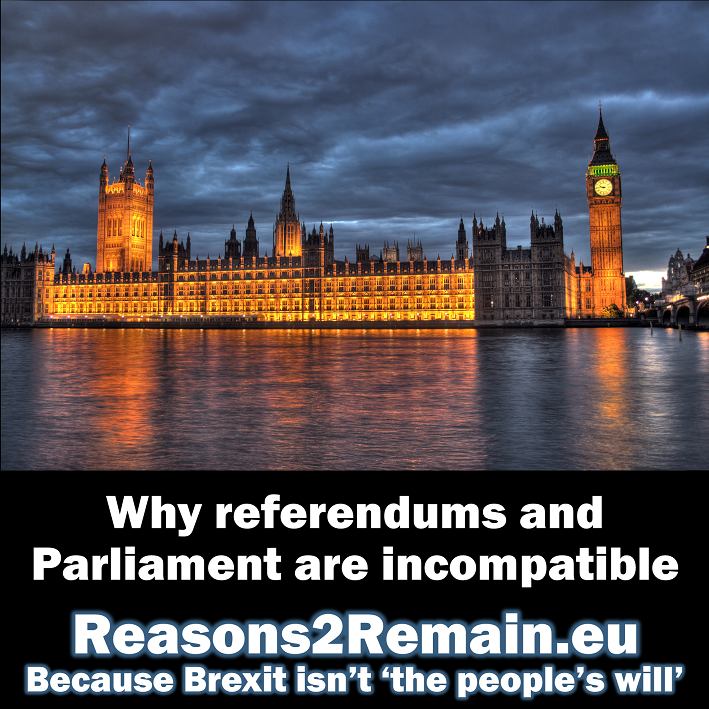 The focus currently is getting a new referendum – coined the ‘people’s vote’. But there will be no point getting a new vote unless we can decisively win that vote. Not just a reversal of the last vote: 52%-48%. But a conclusive vote of 60%-40% or more, to see this matter settled for at least a generation. 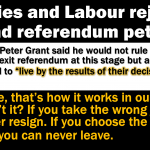 But that’s not going to be achievable if large parts of the country still believe the lies that won the 2016 referendum – lies that would be used again if there is another referendum. There’s an old saying: look after the pennies, and the pounds will look after themselves. The nation needs a compelling reason to have another vote. 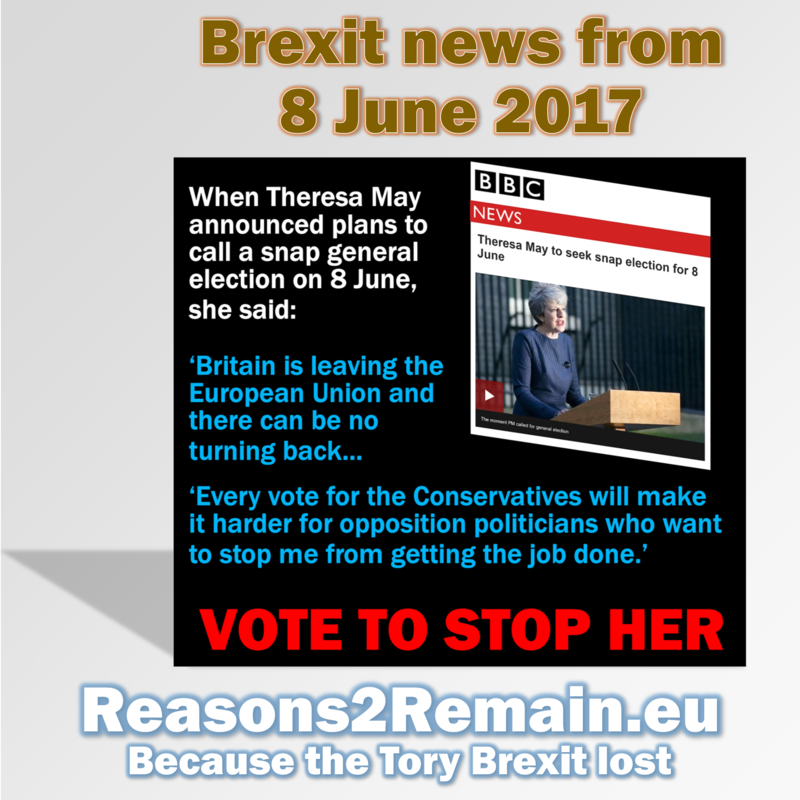 Demolish the lies that led to Brexit, and the call for a new vote will look after itself. And be truly winnable. 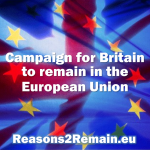 This entry was posted in Current Affairs, Democracy & Citizenship, Media & Communications, Politics & Public Policy, The EU and tagged awareness raising, brexit, European Union, People's vote, pro-Remain, Stronger In. Bookmark the permalink.